Have you always wondered how custom concrete could enhance the exterior of your home in the Melissa, Dallas, Fort Worth, & the surrounding Collin County, TX area? Add some pizzazz to your space by calling the concrete contractors at Mt. Olive Construction. At Mt. Olive Construction, our engineers and concrete specialists work hard to ensure you get exactly what you want. Our experts will come to your home, discuss your ideas for the residential concrete project you have in mind and guide you through the entire process with professional care and attention to detail. We believe in ongoing, honest communication so you'll be well informed and aware of exactly what you're paying for. Our crew members are highly trained, extremely talented and easy to communicate with. Even if you're not sure exactly what your home needs, we'll be happy to provide ideas and recommendations. Call Mt. Olive Construction at 469-867-1391 for the quality concrete services you need to add some style to your home in Melissa, McKinney, Dallas, Fort Worth, & surrounding Collin County, TX area. We pride ourselves on excellent communication and customer services is our number one priority. 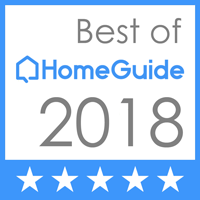 Best of HomeGuide in 2018!